Our "Amazing Animals and Interesting Environments" Reading Clubs are just over 2 weeks away on April 12th! We hope you will take a moment to sign up today to join us for a fun morning of volunteering. We still need 199 volunteers to read to hundreds of excited kids, so be sure to spread the word amongst your family, friends, and coworkers by joining our Facebook event! Are you looking for an easy way to help Reading to Kids? When you shop on Amazon Smile, they will donate 0.5% of your purchases to Reading to Kids! All you have to do is choose Reading to Kids as your charity when you log on. Also, through March 31st Amazon Smile will donate an extra $5 to us when you purchase an eligible item. READING TO KIDS - ENDS THIS SATURDAY! Looking for a cool new shirt to wear when reading to kids? Out of Print Clothing sells high-quality shirts, tote bags, and other items that feature the covers of iconic and often out-of-print book covers. 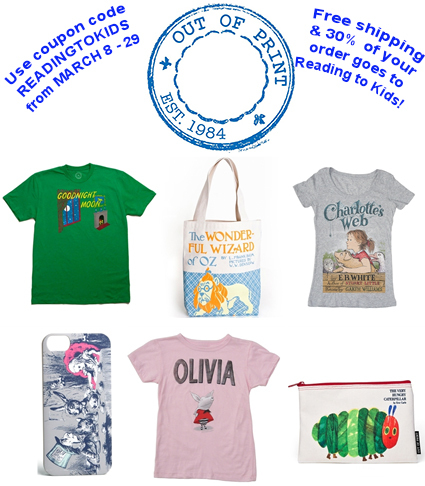 Through this Saturday, Out of Print Clothing is offering free standard shipping and 30% of their proceeds to Reading to Kids! All you have to do is enter coupon code READINGTOKIDS at checkout, then scroll up to the shipping section and click on Free Shipping. Their shirts and other items make great gifts for yourself and others, and through this Saturday, they also benefit Reading to Kids! - Hurry! Only 3 Days left to Shop and Earn $$ for R2K!